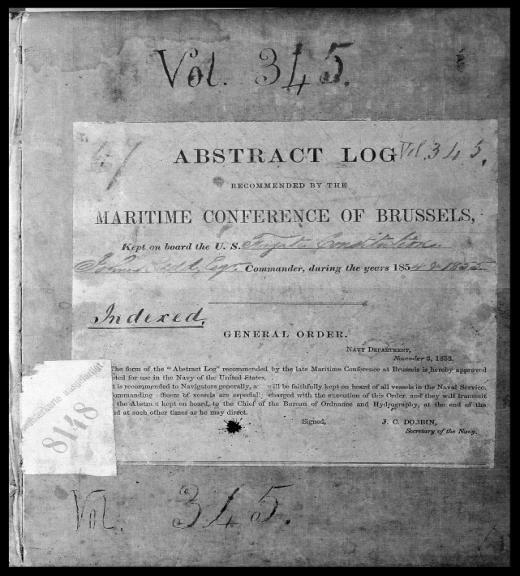 Photo caption: Abstract log of the US Frigate Constitution, 1854-1855. Naval Observatory volume #345; Deutscher Wetterdienst Registration #8148. Reprinted from Braun, D.S., 2000: Scientific vision, a passion for observation, and the impetus for change: Germany loans Maury logs to the National Climatic Data Center. Earth System Monitor, 11, No. 1, 4-7. The discussions of sea level pressure and wind data will be coordinated with the Mean Sea Level Pressure Working Group recently set up through the GCOS/WCRP AOPC. • Create a timetable for enhancing in situ marine datasets in more than one phase, taking account of plans for further digitization of data. • Develop a strategy for creating alternative SST, sea-ice and marine air temperature analyses, including appropriate satellite data, to test models against the legitimate uncertainties in "reasonable" alternative analysis methods. • Consider strategies for the joint analysis of surface pressure and wind data, taking account of time-varying biases in the wind data. • Make recommendations for blending appropriate marine and land-based data to achieve globally complete surface data sets. • Take account of recommendations made by the CLIVAR Climate of the Twentieth Century Project, where a key component involves AGCMs being forced with observed SST and sea-ice extent by around 11 groups. Participants: Members of the SST/SI WG, plus research groups active in the assembly and processing of historical marine data, and of products for SST/SI and other variables (by invitation). Article for CLIVAR Exchanges, September issue (pdf file here).